Success is a snap with this modern design that protects plants from a common mistake: overwatering. Gardeners who like their design as fresh as their herbs can get their fix with this modern windowsill planter. No space? No experience? No matter. 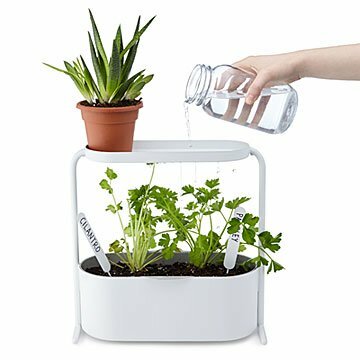 Success is a snap, because the clever and compact two-tier design protects plants from one of the most common mistakes: overwatering. Perforations on the top tier create a gentle, even waterfall. The simple drain system below prevents water from pooling around the roots and preventing them from "breathing." Three stamped metal name tags are included for labeling your plants. Soil and plants not included. Made in China. Born in Seoul, Korea, Sung Wook discovered from a young age a desire to construct things and work with his hands, and grew up dreaming of designing cars. He went on to graduate at the top of the Industrial Design Program at OCAD University. His passion for creating and building follows him even outside of work, where he loves working with modular building sets. Sung Wook strives to create unique impressions through his designs; delving into infinite possibilities and redesigning common products, with the goal of helping people find excitement in everyday life. Wipe clean with mild soap & water.